Thirsty Pilgrim: Beery Guidebooks are the Best Kind. One should never leave home without them. The most useful thing: They always end up being about more than beer. Those who care enough about beer to buy such a book also tend to enjoy other things, such as food and atmosphere. Exactly what you want when traveling abroad, or in your own neighborhood. See, those generic guidebooks have no idea what you want. They have to guess. A beery guidebook just knows. Anyway, the most useful guidebook we've ever owned is Tim Webb's Good Beer Guide Belgium. Maybe because we've been living there for a few years. The second-most useful, by a long shot, is Steve Thomas' Good Beer Guide Germany. Maybe because we travel to Germany a lot. Ah yes... long drive on Autobahn, kid screaming in the backseat, we're all getting hungry... What to do? Mr. Thomas knows. Next stop: Mettlach. 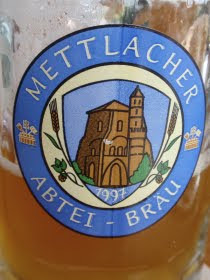 What matters about Mettlach is only this: It's near this particular stretch of highway, and there is a brewpub there. Nothing like a brauhaus lunch to take the edge off. This is back in the fall I guess. We find a sunny spot in the biergarten, with a view of the Saar river when we bother to peek over the line of hedges. The Abtei-Bräu is theoretically a Märzen but it looks like a cloudy but golden Helles to me — not that it makes a bit of difference. It's bitter, somewhat lemony, and refreshing. In that bier and in that garten we find peace, respite, and Schweineschnitzel. All because we have the right book. I wonder where Frommer's would have sent us. I entirely agree and I would plug the books of the US mid-Atlantic by Lew Bryson for their particular usefulness. Not only does Lew direct you to the good beer but he adds good local food, family friendly local things to do and places to stay as well as the local history. He inspired me to get on the roads directly to my south and explore that bit of the USA while hunting out the good beer. i have gone through this blog. i found it very interesting and helpful. nowadays i am working from my home and this blog really doing great for me.